This is an image from a wedding I photographed in the small French town of Chouzé sur Loire in the heart of the wine growing region of the Loire Valley. It was a beautiful hot day and the ceremony was around two o’clock in the afternoon. There were around two hundred guests at the church and everyone looked amazing. 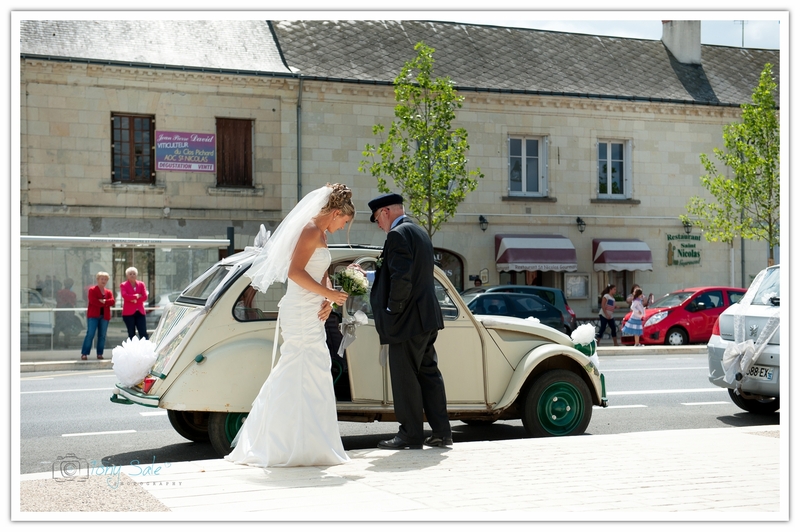 The bride arrived, chauffer driven, in this beautifully restored (or maybe it had just always been kept that good) Citroen C5, and at the moment this photograph was taken she had just got out of the vehicle and was waiting for the right moment to walk down the path and into the church. I love the photo because it looks so typically French and so romantic, the car, the street, the signs the buildings and all bathed in beautiful afternoon sunshine. I will blog more about photographing this wedding in a latter post. If you are planning a destination wedding or a UK wedding in 2016 or 2017 then do get in touch to discuss you wedding photography plans.